Multnomah Falls is about 30 minutes outside of Portland toward the end of the Columbia River Gorge. Visiting Multnomah Falls, a 611-foot-tall roaring, awe-inspiring cascade of icy water, lets you experience the power and beauty of nature up close and with ease. From the parking area off of I-84, a 5-minute walk is all that separates you from the exhilarating spray at the base of the falls. For an even closer view, walk another several hundred feet up the paved trail to reach Benson Bridge, which spans the falls at the first tier’s misty base. Standing on the bridge you have a perfect view of the top tier’s full 542-foot height and a knee-wobbling vantage point over the second tier’s 69-foot drop! The bridge is named for Simon Benson, a prominent Portland businessman who owned the falls in the early part of the 1900s. Before his death, Benson gave Multnomah Falls to the City of Portland, which later transferred ownership to the USDA Forest Service. The steep one-mile trail leading from the base of the falls to the top is loved by locals for its views, wildflowers, and comparative lack of visitors. 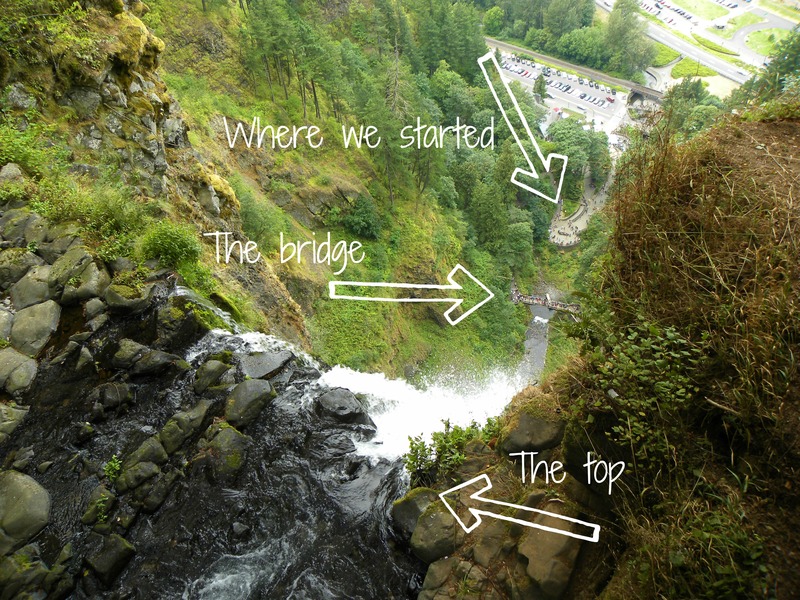 The top of the falls is noted by #2 in the above photo. The great view from the top is worth the exhausting hike before. You did such a varied tour Justina! I’m trying not to scream at that third photo. Husband is still asleep. The view from the top is exhilarating! Gorgeous pics and it looks like a wonderful vacation full of fantastic sights. Golly! Wished I knew you were in Oregon! I live not far from Multnomah Falls…..Door is always open, coffee is always on, and the guest bed is always ready for a guest or two. We love the waterfall and we did the parts of the trail with the other smaller waterfalls the last time we were in Oregon. 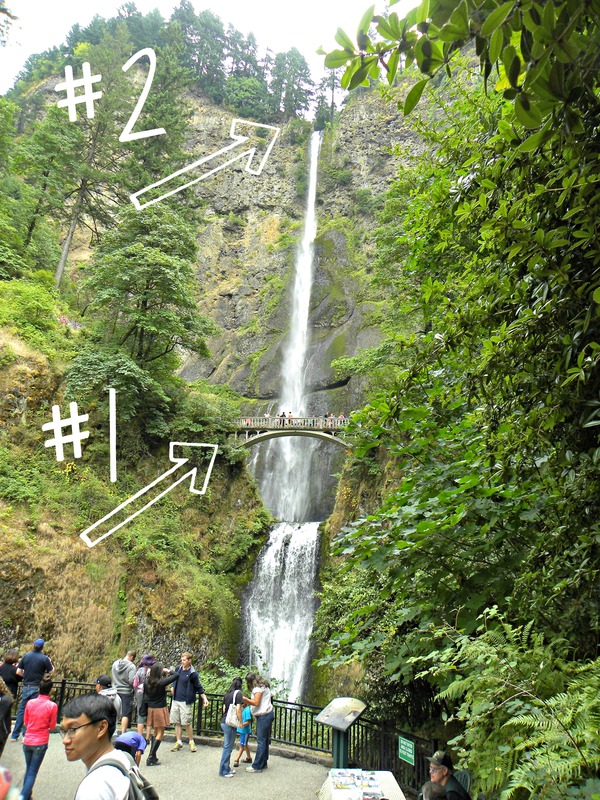 We call Multnomah Falls, Mushmouth because my granddaughter couldn’t pronounce it correctly. That entire area is so beautiful. Cannon Beach and Lincoln City is two more of our favorite spots. Glad you had a great trip. Oh boy, I’d be gasping for breath after a climb like that! Great view and a gorgeous waterfall. Ah, Miss Chef was there on a school trip long ago. She printed a poster from a photo she took there, and it now hangs in our bedroom. The view from the top is spectacular, but after barely making it up Chimney Rock, I’m willing to bet I couldn’t climb a mile. Just stunning place! Amazing to see this bridge!